When you think of traditional Christmas wreaths, your mind is probably filled with lush, green versions decorated with holly leaves and red berries. This festive season, we thought we’d do something a bit jolly and opt for an alternative design of the popular Christmas decor. If you want to follow suit, then you’ll be delighted to hear that we’ve featured everything from floral and succulent varieties, to crocheted, pom pom adorned, and even edible versions of wreaths. There’s certainly a wide variety among this list! This DIY wreath from 100 Layer Cake is such an interesting alternative to a Christmas wreath. It features oranges – how fantastic! A Crocheted Simplicity has created this DIY alternative wreath which features pom pom snowman! Children and adults alike are going to love this one. How’s this for an alternative version of your more traditional Christmas wreath? A Blonde’s DIY Life created this stunning mosaic mirror style wreath. Can you believe that this wreath was made using cardboard toilet roll holders? Neither can we, it looks stunning! Bonnin Designs is the talented crafter behind this DIY. Wow, take a look at this crocheted wreath alternative! Boys and Bunting have created it to feature all of the colors of the rainbow. Brit + Co have made a DIY wreath containing on-trend succulents – we love it! Imagine hanging this on your front door during the festive season. This DIY wreath can easily be made using leftover Christmas wrapping paper, so it really is both thrifty and creative! Centsational Girl is the genius behind this project. How stunning is this DIY alternative wreath made from feathers? To make one for yourself, you’ll have to check out the full tutorial from Chatelaine! Fancy creating your own yarn ball wreath, just as Dale Mackey has done? These yarn balls are hand-rolled, but you can also buy them already made if you’re limited with time! The Darice Craft Blog will show you how to turn some tissue paper into a tropical leaf inspired wreath. This is a wonderful alternative to your more traditional holly-adorned Christmas wreath. Have you ever seen a Christmas wreath like this one from Design Lovefest? The design is inspired heavily by woven wall hangings – we adore it! Inspiration for this DIY alternative wreath can be found via Design Sponge. It features a modern and angular look! What’s interesting about this DIY Christmas wreath is the way it features a metal hanger, just like a clothes hanger! Freckle and Wulff will show you how it’s done. Here’s another Christmas wreath which has been inspired by woven wall hangings. This one is from Glade and it’s sure to motivate you to create your own! Here’s a fun alternative wreath idea for the wine lover! Using your leftover wine corks, you too can recreate this masterpiece by Good Housekeeping. Gwenny Penny has come up with an idea for an alternative wreath that will also display your Christmas cards – isn’t that great? We love the idea of using wooden pegs. As fans of all things ombre and pink, you can imagine our delight at spotting this pretty DIY wreath from Hipster Mum! It’s made using paint chips, so is super affordable (basically free) to create. This DIY candy cane wreath features white and red fabric, along with a gorgeous satin bow. I Heart Nap Time has truly outdone herself here! Red flowers and silver baubles – what a wonderful and alternative combination for Christmas! Although featuring traditional colors, Landee See, Landee Do has added the twist of using flowers. Speaking of flowers, this fresh and floral DIY wreath from Lisa Loves John is so beautiful! It’ll feel like spring during the festive season with this gorgeous design. If you love ‘jingle bells’, then this DIY wreath from Love Pomegranate House for you! The addition of a large bow really makes it a showpiece. Who knew paper doilies could look so beautiful when placed on a wreath and illuminated with string lights? Trust Martha Stewart to come up with this alternative idea! You probably wouldn’t think of blue as a Christmas color, but that’s what makes this alternative wreath by Midwest Living such a treat! It’s unexpected, yet totally works. Love adding shades of pink to your festive décor? Go all out with this DIY alternative wreath from Midwest Living. It’s made using an old sweater! Also from Midwest Living, this wonderful wreath is made from flowers and fruit. It’s the perfect alternative for those who love this gorgeous color palette! Even paper pinwheels can be arranged to form an alternative wreath – is there anything Midwest Living can’t do? Which version is your favorite from this blog? It just wouldn’t be a round-up of alternative Christmas wreaths without a pom pom version, would it? Mom Advice has created hers in a neutral palette of white. Rather than using these shiny bows on your gifts, you can turn them into a head-turning wreath for the festive season. Find out all you need to know by checking out the tutorial from Polkadot Chair. Speaking of stunning gift bows, here’s a similar idea from Real Simple, this time featuring gold versions. This design is so eye-catching! You can also use some ribbon and felt holly leaves to create this masterpiece from Shauna Younge. This is so simple and fast to make too! Here’s another DIY wreath which has been created using paint chips to portray an ombre effect – pretty! Style at Home will show you how it’s done. A wire hoop and golden bits and bobs can be used to make this wreath alternative by Style Me Pretty! These would make wonderful gifts for loved ones too. Is it possible to create a wreath using candy? You bet it is! Sweet and Lovely Crafts has certainly shown us this through her clever tutorial. You can also use ribbons to make a wreath just like this one from Sweet Tea and Saving Grace. We love those colors and patterns! This is a very unique and geometric inspired design from The Décor Fix! It’s also a beautiful and alternative wreath on a small budget – perfect! Who knew that PVC pipes could be turned into a DIY wreath and a beautiful one at that? Today’s Nest has a great step-by-step guide for you! Antlers and florals – what a fantastic idea for an alternative Christmas wreath from Twelve on Main! Hang this on your door and watch your neighbors ask you where you ‘bought’ it from. Even cardboard can make a pretty wreath, just ask We Are Scout! This looks like something you’d pay a small fortune for in a high-end boutique. And now for the big finale – you can even use paper straws to create the alternative Christmas wreath of your dreams! Ta-da! Thanks Woman’s Day for this awesome tutorial. 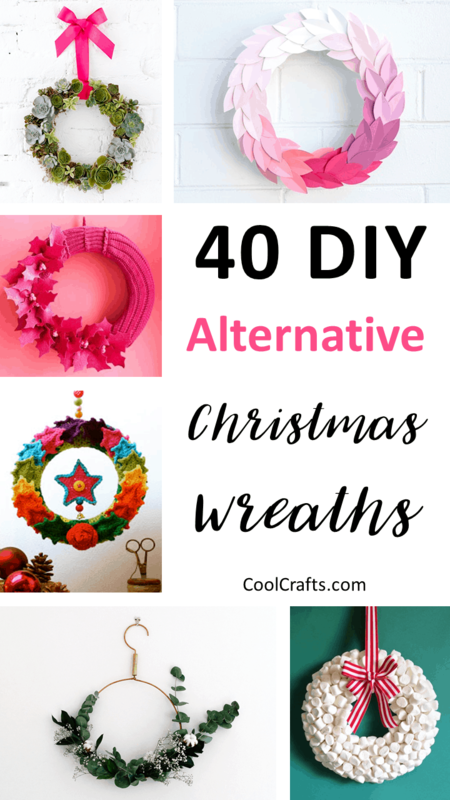 There you have it – 40 DIY Alternative Christmas Wreaths to jazz-up your festive season this year! Which projects were your favorites? We’d love to hear from you in the comments section below!